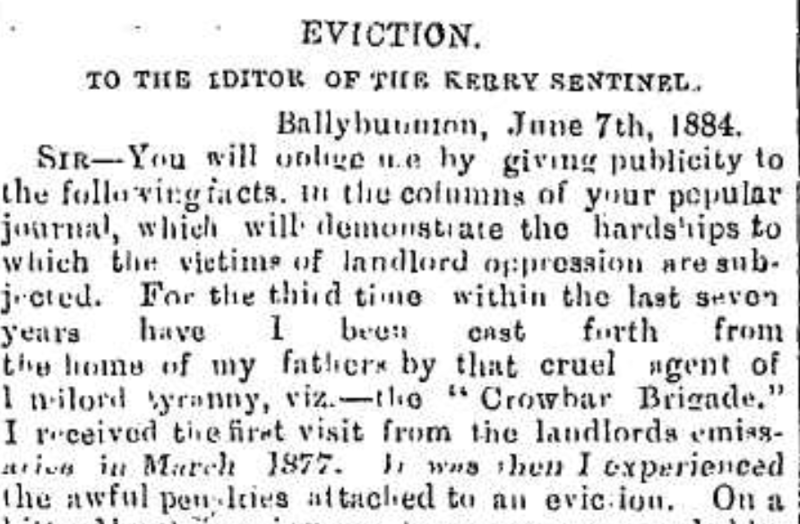 Sir,You will oblige me by giving publicity to the following facts in the columns of your popular journal to demonstrate the hardships to which the victims of landlord oppression are subjected. 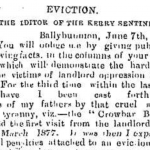 For the third time in the last 7 years have I been cast forth from the home of my fathers by that cruel agent of landlord tyranny viz-the “Crowbar Brigade”. I received the 1st visit from the landlord’s emissaries in March 1877. It was then I experienced the awful penalties attached to an eviction. On a bitter March morning my house was surrounded by the sheriff with his staff of police, bailiffs, etc. My personal effects were thrown out by the bailiffs who took a fiendish delight in their work – my aged mother suffered such a shock that she became from that day forth a helpless invalid. I did not owe a penny rent, yet such was the state of agrarian legislation that my future was left to the tender mercies of an arbitrary landlord. The same was enacted in April ’82 and finally in April ’84 my house was surrounded by the sheriff, police etc. and my invalid mother was carried out in a downpour of rain by 2 emergency men and having received the last rites of the Church died a few days later , a victim of landlord oppression. Such is a brief outline of the many wrongs I have suffered . I will now briefly state the facts which led to my last eviction. I hold 2 farms one at Bromore and the other at Trippol. The aggregate rent is 27 pounds-5 shillings, the valuation 12 pounds. The Landlord is Mr Wilson Gun and the agent G.R. Brown his son in law. Since the first day he inherited the property I have been to him (for some unaccountable reason) an object of especial hatred. Last Jan I sold one of my farms with the land lord’s consent and lodged in the bank the amount of arrears due, one year’s rent, but he would not sanction the sale unless I sold both, an arrangement I indignantly refused. His object simply was to get rid of me as peaceably as he could but I who have been trice victimised by him will endure the greatest privations ere I would abandon the land of my forefathers. He thinks I must finally yield , but I publicly avow that as long as a drop of blood courses through my veins I will never submit to terms dictated by a representative of that miserable set whose ascendancy has given way to the enlightened sway of public opinion and the will of a determined people . P.S. I may mention that when I lodged the money in bank and secretly rejoiced in triumphing for a third time , the writ already ( ………not sure what this word is) was executed a few days afterwards ,the humane agent having a few days previously departed for England after issuing his orders to his minions. Just wondering if John Stack is related to my 2xGreat Grandmother Joanna Dore/Dower (nee Stack) ? My ancestors came from the Ballybunion area.